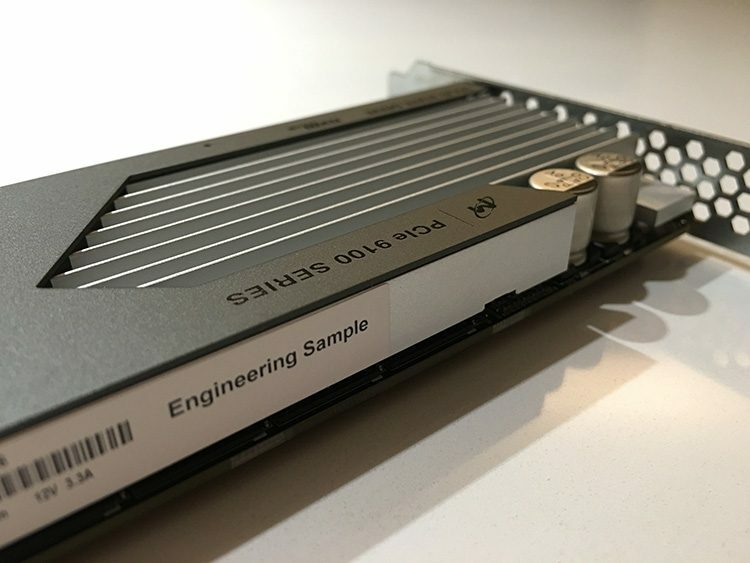 Intel Xeon Silver 4108 8 Core. I need to have a healthy number of cores in my system to run some test workload. Primarily to understand host and cluster scheduling. I do not need to run performance tests, thus no need for screaming fast CPU cores. TDP value of 85W. 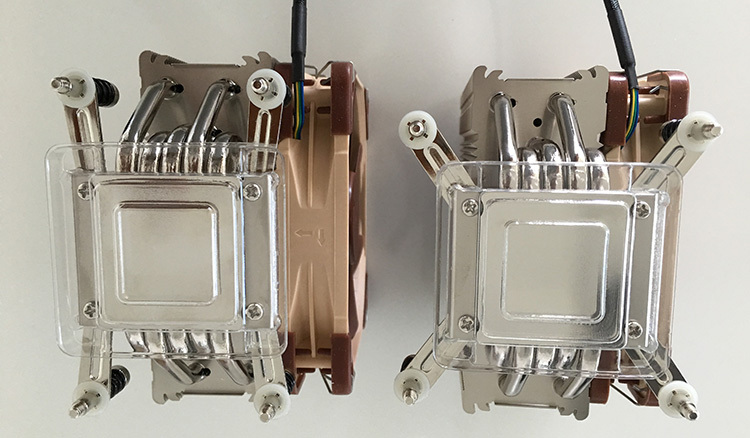 I know there is a 4109T with a TDP value of 70W, but they are very hard to get in the Netherlands. 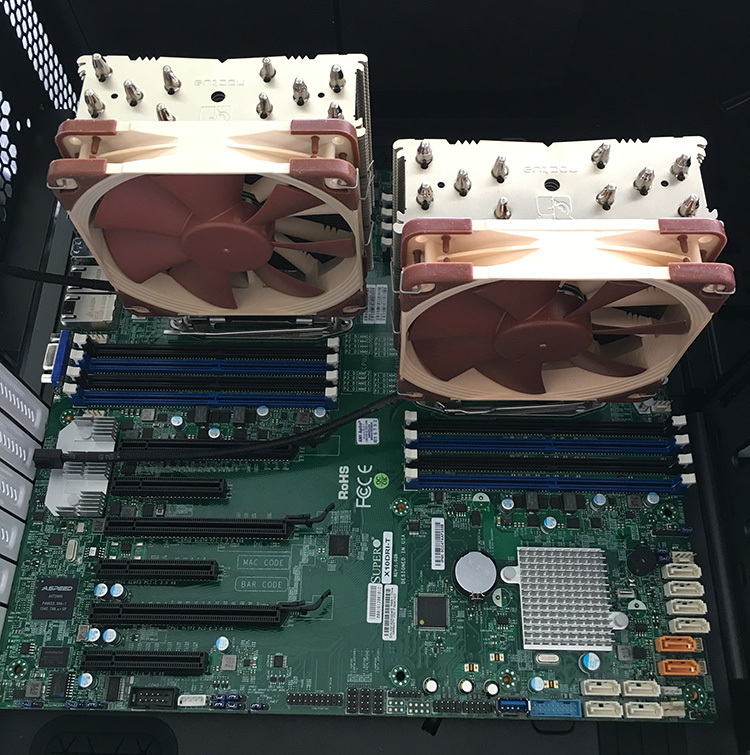 Supermicro X11SPM-TF.Rocksolid Supermicro, 2 x Intel X722 10GbE NICs onboard and IPMI. Kingston Premier 4 x 16 GB 2133 MHz. DDR4 money is nearing HP Printer Ink prices, 2133 MHz is fast enough for my testing, and I don’t need to test 6 channels of RAM at the moment. The motherboard is equipped with 6 DIMM slots, so if memory prices are reducing, I can expand my system. Intel Optane M.2 32 GB. ESXi still needs to have a boot device, no need to put in 256 GB SSD. This is the config I’m considering. What do you think? Any recommendations or alternate views? When starting your home lab, all hints and tips are welcome. The community is full of wisdom, yet sometimes certain topics are taken for granted or are perceived as common knowledge. The Home Lab fundamentals series focusses on these subjects, helping you how to avoid common pitfalls that provide headaches and waste incredible amounts of time. One thing we always keep learning about vSphere is that both time and DNS needs to be correct. DNS resolution is important to many vSphere components. You can go a long way without DNS and use IP-addresses within your lab, but at one point you will experience weird behavior or installs just stop without any clear explanation.In reality vSphere is build for professional environments where it’s expected that proper networking structure is in place, physical and logical. When reviewing a lot of community questions, blog posts and tweets, it appears that DNS is partially setup, i.e. only forward lookup zones are configured. And although it appears to be ”just enough DNS to get things going, many have experienced that their labs start to behave differently when no reverse lookup zones are present. Time-outs or delays are more frequent, the whole environment isn’t snappy anymore. Ill-configured DNS might give you the idea that the software is crap but in reality, it’s the environment that is just configured crappy. When using DNS, use the four golden rules; forward, reverse, short and full. DNS in a lab environment isn’t difficult to set up and if you want to simulate a proper working vSphere environment then invest time in setting up a DNS structure. It’s worth it! Besides expanding your knowledge, your systems will feel more robust and believe me, you will wait a lot less on systems to respond. With vCenter Single Sign-On, local operating system users become far less important than the users in a directory service such as Active Directory. As a result, it is not always possible, or even desirable, to keep local operating system users as authenticated users. This means that you are somewhat pressured into using an ‘external’ identity source for user authentication, even for your lab environment . One of the most popular configurations is the use of Active Directory as an identity source. Active Directory itself uses DNS as the location mechanism for domain controllers and services. If you have configured SSO to use Microsoft Active Directory for authentication, you might have seen some weird behavior when you haven’t created a reverse DNS lookup zone. Ensure that DNS reverse lookup returns a Fully Qualified Domain Name (FQDN) when queried with the IP address of the host machine on which vCenter Server is installed. When you install or upgrade vCenter Server, the installation or upgrade of the Web server component that supports the vSphere Web Client fails if the installer cannot look up the fully qualified domain name of the vCenter Server host machine from its IP address. Reverse lookup is implemented using PTR records. Before deploying vCenter I recommend to deploy a virtual machine on the first host running a DNS server. The ESXi Embedded Host Client allows you to deploy a virtual machine on an ESXi host without the need of having an operational vCenter first. As I use active Directory as identity source for authentication, I deploy a Windows AD server with DNS before deploying the vCenter Server Appliance (VCSA). Toms IT pro has a great article on how to configure DNS on a Windows 2012 server, but if you want to configure a lightweight DNS server running on Linux, follow the steps Brandon Lee has documented. If you want to explore the interesting world of DNS, you can also opt to use Dynamic DNS to automatically register both the VCSA and ESXi hosts in the DNS server. Dynamic DNS registration is the process by which a DHCP client register its DNS with a name server. For more information please check out William article “Does ESXi Support DDNS (Dynamic DNS)?” . Although he published it in 2013. it’s still a valid configuration in ESXi 6.0. IPv4 configuration for nic0 of this node cannot be edited post deployment. This occurs when the VMware vCenter Server Appliance 6.0 is deployed using an IP address. During the initial configuration of the VMware vCenter Server Appliance, the system name is used as the Primary Network Identifier. If the Primary Network Identifier is an IP address, it cannot be changed after deployment. This is an expected behavior of the VMware vCenter Server Appliance 6.0. To change the IP address for the VMware vCenter Server Appliance 6.0 that was deployed using an IP address, not a Fully Qualified Domain Name, you must redeploy the appliance with the new IP address information. Changing the Primary Network Identifier (PNID) of the vCenter Server or PSC is currently not supported and will cause the vSphere services to fail to start. If the vCenter Server or PSC has been deployed with an FQDN or IP as the PNID, you will not be able to change this configuration. Revert to a snapshot or backup prior to the IP address or hostname change. This means that you cannot change the IP-address or the host name of the vCenter Appliance. Yet another reason to deploy a proper DNS structure before deploying your VCSA in your lab. A workaround for this issue is to ensure that all DNS servers have the Reverse Lookup Zone configured as well as Active Directory Domain Controller (AD DC) Pointer (PTR) records present. Please note that allowing domain authentication (assuming AD) on the ESXi host does not automatically add it to an AD managed DNS zone. You’ll need to manually create the forward lookup (which will give the option for the reverse lookup creation too). When you do not have a reverse lookup zone configured, you may experience a delay of several seconds when logging in to hosts via SSH. When you’re management machine is not using the same DNS structure, you can apply the quick hack of adding “useDNS no” to the /etc/ssh/sshd.config file on the ESXi host to avoid the 30-second password delay. As DNS is an extra dependency, a lot of newer technologies try to avoid incorporate DNS dependencies. One of those is VMware HA. HA has been redesigned and the new FDM architecture avoided DNS dependencies. Unfortunately not all VMware official documentation has been updated with this notion: https://kb.vmware.com/kb/1003735 states that ESX 5.x also has this problem but that is not true. Simply put, VMware HA in vSphere 5.x and above does not depend on DNS for operations or configurations. First rule of Home Lab club, don’t talk about time sync! Or so it seems. When starting your home lab, all hints and tips are welcome. The community is full of wisdom, however sometimes certain topics are taken for granted or are perceived as common knowledge. The Home Lab fundamentals series focusses on these subjects, helping you how to avoid the most common pitfalls that provide headaches and waste incredible amounts of time. A ‘time-consuming’ pitfall is dealing with improper time synchronization between the various components in your lab environment. VMware doesn’t provide a separate time keeping best practices document for vCenter, but provides multiple guidelines in the vCenter Server Appliance configuration guide. When installing vCenter on a Windows machine it’s recommended to sync to the PDC emulator within the Active Directory domain. In general, VMware recommends to use native time synchronization software, such as Network Time Protocol (NTP) with the various vSphere components. NTP is typically more accurate than VMware Tools periodic time synchronization and is therefore preferred. There are multiple schools of thoughts when it comes to time sync in a virtual data center. One of the most common ones is to synchronize the virtual datacenter infrastructure components such as ESXi hosts and the VCSA to a collection of external NTP server. Typically provided by http://www.pool.ntp.org/en/ or the US Naval observatory: http://tycho.usno.navy.mil/NTP/. Windows virtual machines sync their time to the Active Directory domain controller running the PDC emulator FSMO role: Time Synchronization in Active Directory Forests http://social.technet.microsoft.com/wiki/contents/articles/18573.time-synchronization-in-active-directory-forests.aspx It’s recommended to point the ESXi hosts to the same time source as the PDC emulator of the active directory. When running Linux best practice is to sync these systems with an NTP server. Another widely adopted design is to sync ESX servers to the to the Active Directory domain controller running the PDC emulator FSMO role. VCSA time keeping configuration provide two valid options; NTP and hosts. In this scenario, select the host option to ensure time between the host and VCSA is in sync. If the VCSA is using a different time source other than the ESX host, a race condition can occur between time sync operations and can lead to failing the vpxd. The time synchronization checkbox controls only whether time is periodically resynchronized while the virtual machine is running. Even if this box is unselected, by default VMware Tools synchronizes the virtual machine’s time to the ESXi host clock after the listed events. If the ESXi host time is incorrect it is likely that “unexplainable” errors will occur. I experienced this behavior after migrating a VM with vMotion. I couldn’t log on to a windows server as the time skew prevented me from authenticating. You can either disable these options by adding rules to the VMX file of each VM or just ensure that the ESXi host is syncing the time with a proper external time source. For more information: Disabling Time Synchronization (1189) https://kb.vmware.com/kb/1189. Be aware that as of vSphere 4.1 ESXi hosts are set to Universal Time Coordinated (UTC) time. UTC is interesting as its the successor of Greenwich Mean Time (GMT) but UTC itself is not a time zone, but a time standard. There are plenty of articles about UTC, but the key thing to understand is that it never observes Daylight Saving Time. As UTC is not a time zone, you cannot change the time notation in ESXi itself. The vSphere client, web client and HTML5 client automatically display the time in your local time zone and will take into account the UTC setting on the host. This isn’t bad behavior, just be aware of this so you don’t freak out when you check the time via the command line. ESXi synchronizes its system time with the hardware clock (CMOS/BIOS/ACPI)of the server if the NTP service is not running on the ESXi host. 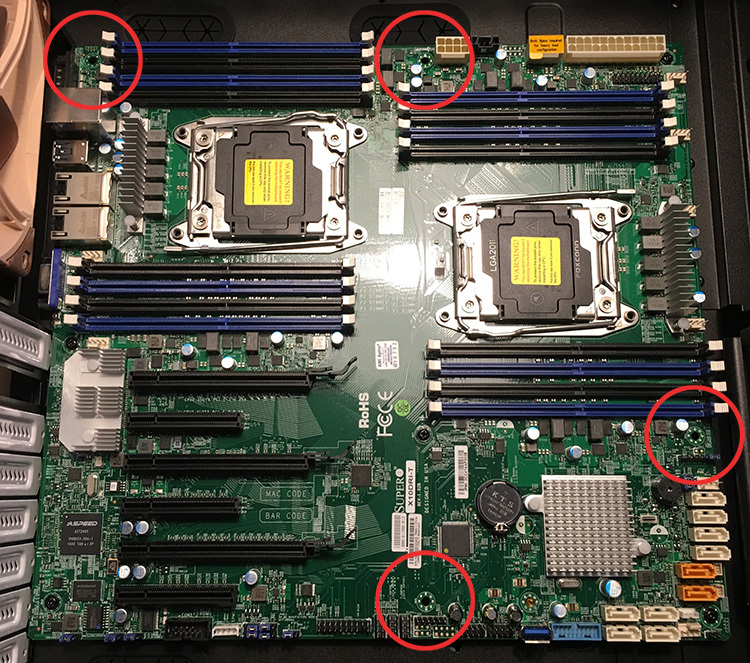 SuperMicro boards allow for NTP synchronization, but most home lab motherboards just provide the time as being configured in the BIOS. When the NTP daemon is started on the ESXi host it synchronizes its system time to the external time source AND it updates the hardware clock as well. I ran a test to verify this behavior. At the time of testing it was 12:37 (GMT+1 | UTC 10:37), NTP turned off and set the time in the BIOS to 6:37 UTC time. After booting the machine the command esxcli system time get confirmed ESX system time retrieved the time from the hardware clock. After starting the NTP Services, the system time was set to the correct time: 10:37.The command esxcli hardware clock get demonstrated that NTP also corrected the BIOS time. A quick BIOS check confirmed esxcli hardware clock get was displaying the BIOS configuration. If your lab is not connected to the internet, confirm the BIOS time with the command esxcli hardware clock get and if necessary use the command esxcli hardware clock set -d (Day) -H (Hour) -m (Minute) -M (Month) -s (Second) -y (Year) to set the correct time. Please note that ESXCLI reports time with the Z (Zulu) notation, this is the military name for UTC. When having a home lab, you usually face the age old dilemma common sense vs ‘exciting new stuff that you might not need but you would like to have’. You can update your CMOS clock manually or scripted, you can connect to an array of external NTP servers or you can build your own Stratum-1 NTP server using a Raspberry PI with a GPS add-on board . Home labs are interesting beasts, at one hand you would love to have all the compute, storage and network power available, on the other hand you do not want to have a power bill similar to a Google data center. I have a decent setup, with 4 Xeon servers, two cisco 1GB switches, a 10Gb switch and 3 Synology’s, but I don’t keep everything on all the time. One server acts as the management server, running a Windows DC, vCenter appliance, the PernixMS server and some other stuff. These machines are always on, not only to save time when I want to use my lab but increased stability as well. Due to this, my network gear and storage systems are also on. Which made me wonder how much the need for availability and stability will cost me on a yearly basis. The big Xeon rigs equipped with multiple PCIe devices are usually shut down after tests because I expect them to consume lots of power. Time to stop guessing and start monitoring. As always Home Lab Sensei Erik Bussink pointed me out to a simple solution the Smart Plug Edimax SP-2101W Smart Plug Switch. Please leave a comment if you are using a different solution that is a better alternative to this device. Nothing much to add about the device itself, it is sleek enough so it will not eat up multiple power outlets. 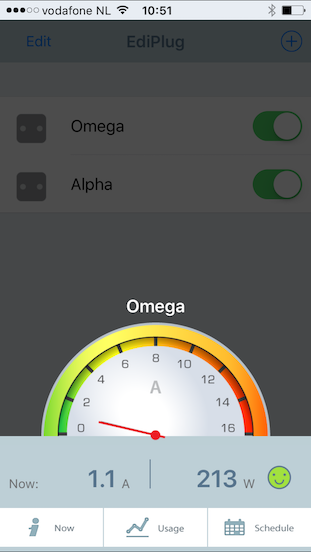 The device is managed via an apple or android app, the following screenshots are taken from an Apple device, you can monitor it with both your iPhone or iPad. 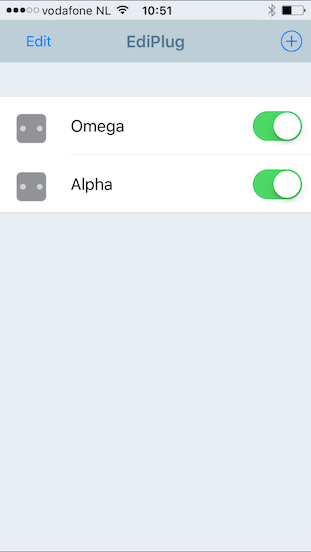 You can manage multiple smart plugs from one device. As I’ve spread my lab over two power-groups I’ve installed two power-plugs to monitor my home lab. Unfortunately, the app doesn’t allow displaying two smart plugs simultaneously, you have to open each individually. 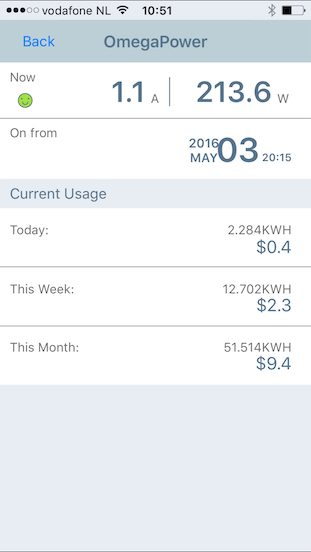 The monitor page shows the real time power consumption registered by the plug. It displays Amps and Watts. Quite cool to see what happens when you power-on devices or even a virtual machine, this monitored server generates a spike of 30 watts when powering on a VM, it quickly returns to a steady state though. Fun to see that ESXi hosts do not consume a steady high state of power. 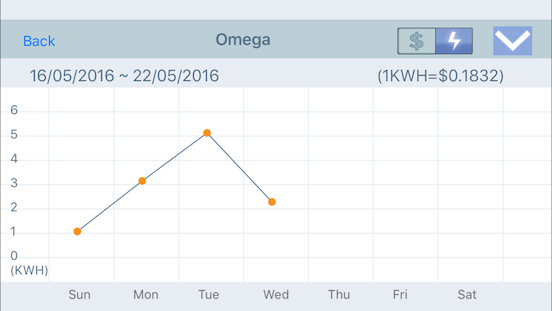 The Now button shows the real-time power consumption and the total power consumption registered of today, this week and this month. By providing the price of energy, it calculates the total cost additionally. Unfortunately I haven’t found the option to change the currency sign, so you are stuck with the dollar sign. 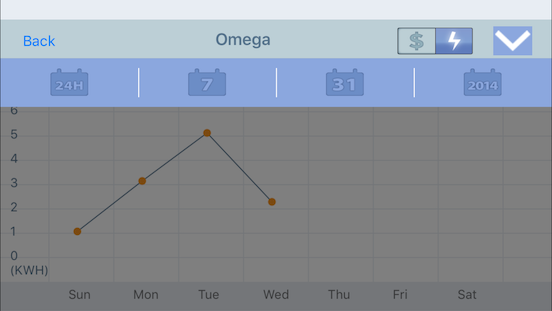 By selecting the Usage button provides you a chart to view the power consumption of that day. The app allows you to analyze power consumption trends of your home lab by provides an overview based on 24 hours of data, a week, a month and a full year. 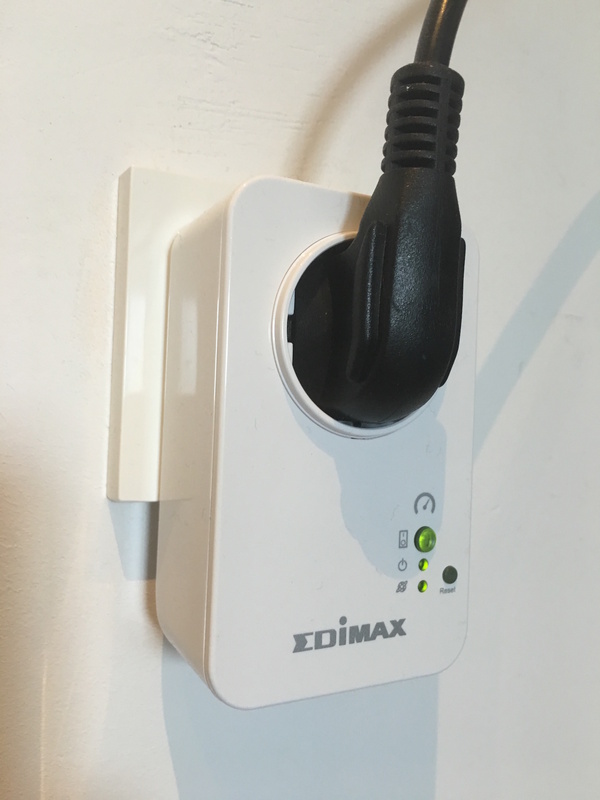 The smart plugs are a great addition to my home lab, it provides me insights in the consumption and it for me personally have removed the reluctancy of leaving my full lab on. The answer to the question whether you need a smart plug if you run a home lab is in my opinion a straight and simple no. You can estimate cost or you can just ignore it and pay the bill when it arrives. I’m just curious about these things and it helps to clear my conscious.